Chic in the city, strong in the country. Crosswalk R is the new high performance all terrain pushchair with a compact folding system. Its cool design makes it ideal for the city. Its strength makes it a unique pushchair for the country. And what’s more, its large size wheels with independent suspension and the aluminium tubular chassis make it really hard-wearing and safe, while giving it its own unique and very appealing style. Complete with the award-winning Matrix Light 2 car seat that converts into a carrycot. It offers a lie flat position both in the car and on the pram, which is the healthiest way for them to travel especially on longer journeys as there is no time limits. The Matrix can also be used for overnight sleeping and is an ideal environment for your newborn as it supports a natural, healthy sleep. 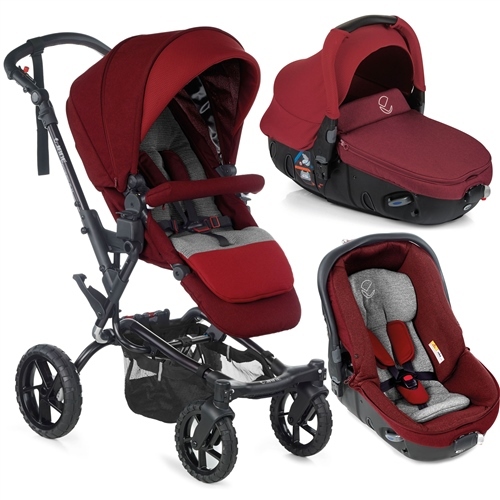 Independent long travel suspension with 2 shock absorbers for rough roads offers baby maximum comfort at all times. Large all-terrain wheels with Hydrolytic PU tyres that are 10 times more hard-wearing than traditional pushchair tyres. Double brake lock is located on the handlebar instead of the chassis to allow plenty of clearance for all-terrains. Large sized seat with multiple reclining positions including a unique fully horizontal 180° Lie-flat seat position for new-born babies, supports natural, stress-free sleep. Extra-large, extendable and breathable hood repels water and offers UV50+ solar protection. The synthetic leather handlebar can be adjusted to suit everyone (85 - 107 cm). Extremely compact patented folding system with automatically retracting rear wheels to make it 10% more compact. Coordinating Pram Bag with changing mattress. Coordinating and Reversible seat liner. Extra large extendable UV50+ hood. New-born lie-back seat unit with Extra-large, extendable and breathable hood repels water and offers UV50+ solar protection. Raincover included. Large puncture proof PU wheels which are 10 times harder wearing and give plenty of clearance for all-terrains. even with the seat attached, thanks to its detachable wheels and its patented folding action that makes it 10% more compact. 85-107 cm Leatherette ergonomic handlebar with coordinating coloured stitching. Pro-Fix system locks and unlocks car seats with just one movement, eliminating the need for awkward fitting kits. Reversible and detachable seat unit. Suitable from birth, the backrest has multi reclining positions and a lie-flat mode, offering the child greater comfort. Compact folding, even with the seat unit still attached. All wheels detachable for extra compactness. Large all-terrain wheels with PU tyres that have greater shock absorbing properties and are 10 times more hard-wearing than EVA traditional tyres. Long travel independent suspension with 2 shock absorbers. Inverted “C” shaped rear structure makes room for your feet and easier to push. Double brake lock on the handle. Height adjustable handle (85 - 107cm).